Technological Pedagogical Content Knowledge model or TPACK model (Figure), developed by Mishra and Koehler in 2006, explains the relationship between the different types of knowledge needed to teach effectively using technology. When ICT tool is used in teaching, the content taught and the pedagogy need to be adapted to it.The basic idea of the TPACK model (Figure) is the following: in order to teach effectively using technology, it is important to adjust the course content to the chosen technology and teaching methods and mutually adapt them and thus mutually reinforcing them. Mishra and Koehler (2006) argue that teaching is most effective when content knowledge (CK), pedagogical knowledge (PK) and technological knowledge (TK) are used in an integrated TPCK way, while taking into account the contexts in which teaching takes place. The interface between the three sections, i.e. 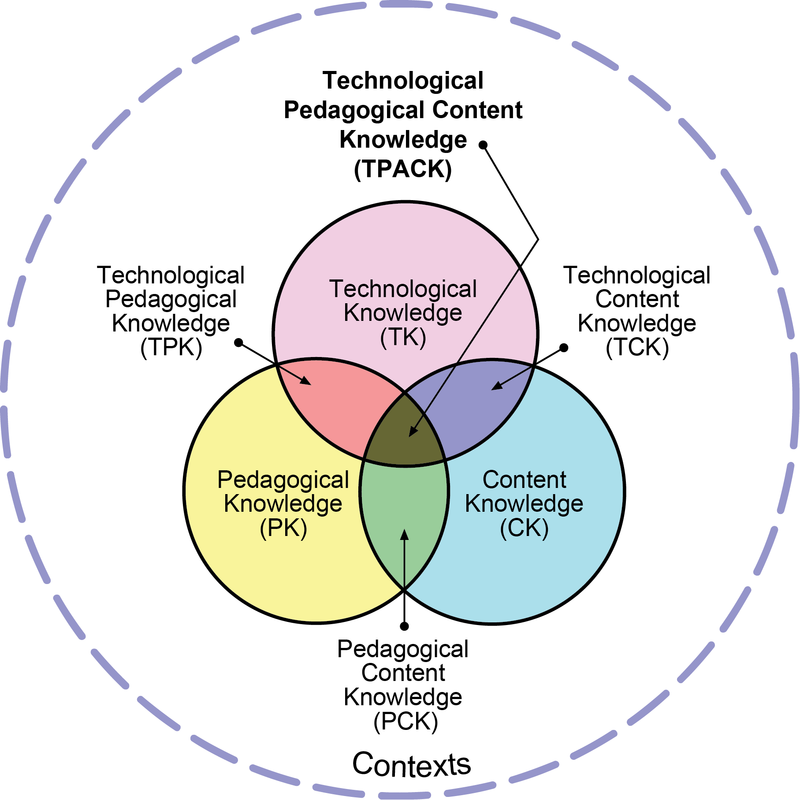 pedagogical, technological and content knowledge (TPCK) positioned in the middle of the TPACK model, represents the optimal level of knowledge integration for designing technology-enhanced teaching and learning. The course design depends on the learning goals, the subject matter, the technology used and the context. This makes every course unique and turns every lecturer into a creative designer of challenging learning activities for students. Using TPACK lecturer invests in finding appropriate teaching methods for his or her chosen content, considers reasons for selecting a specific learning technology tool for the chosen pedagogy and content, and uses these in an integrated and constructive way in order to help students construct their knowledge at the required cognitive level. Mishra, P., Koehler, M. J. (2006). ‘Technological Pedagogical Content Knowledge: A Framework for Teacher Knowledge.’ Teachers College Record, 108(6), 1017–1054.